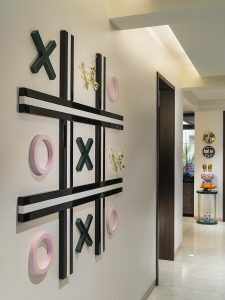 In one of the quieter lanes of Saket, South Delhi, is a home; a showcase of a mix of influences; a narrative expressed through different mediums — with edgy interiors dovetailing interesting pieces of furniture, art and sculptures. 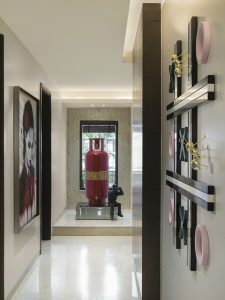 A space that breaks the norms of a conventional Indian residence. 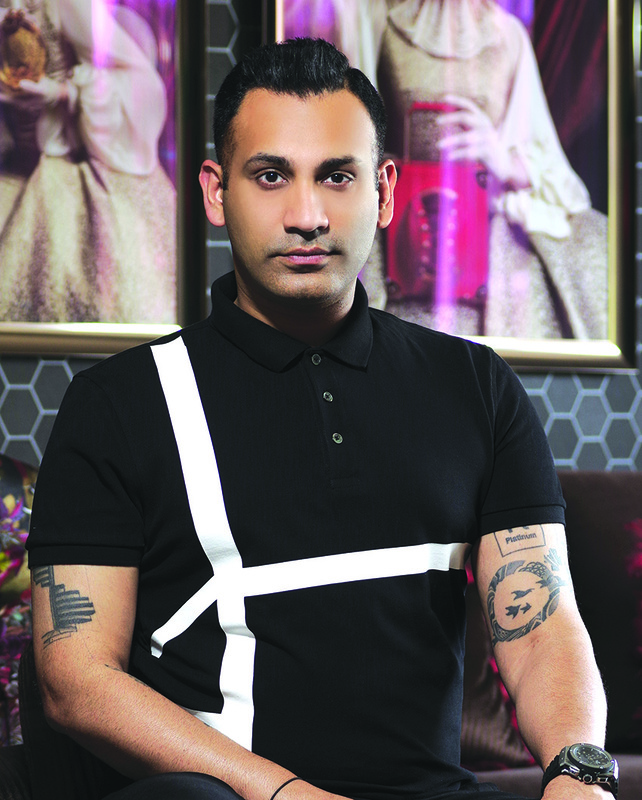 Welcome to the home of Sanjyt Syngh, intrepid designer and founder of Sanjyt Syngh Design Studio (SSDS). A textured Carlucci de Chivasso wallpaper series by JAB Anstoetz, bedecked by Lebanese lensman Eli Rezkallah’s photograph series, creates a stunning backdrop for this part of the living room. A Eichholtz chandelier and Alex Davis centre table complete the aesthetic picture. This section for the living room is dominated by March Ahead, an artwork by Sanjyt. Its protagonist is a rhinoceros — wrongly perceived as a unicorn. This sets the concept of the art — that things are actually not what they seem. The inlays of parallel brass lines symbolize the guiding lines that lead you in the right direction. While all the cushions are by SSDS, the ones in brown velvet are printed with surrealistic imagery by Kit Miles. The sombre and earthy dining room is draped in aqua tones — as can be seen in the puffin artwork by award-winning National Geographic lensman Sunil Gopalan. 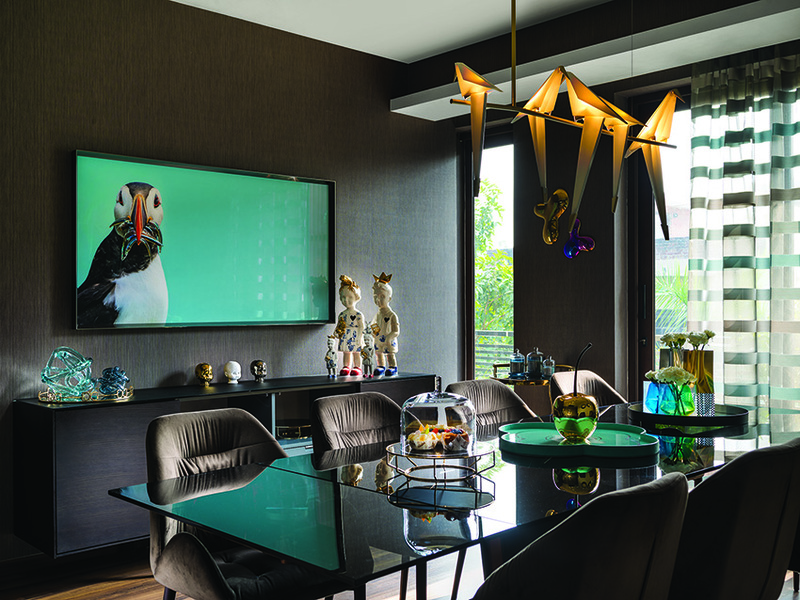 The avian touch is continued in Moooi’s Perch chandelier. Sheer curtains from Floor & Furnishings filter in daylight in a soft glow. Clonette Dolls on the cabinet are by Dutch sisters, Lammers en Lammers. 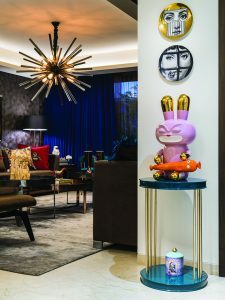 Sanjyt’s penchant for delivering precisely tailored, sophisticated spaces and his skills in interior styling, product sourcing and bespoke art installations — expertise that is offered, among other things, at his studio as well — is amply evident in his home. In his own words: “It takes a big mix of elements to form a space. And they all have their role to play. Be it a chandelier or that candle in the right colour. It’s the smaller details that play a bigger role. Every object has been thoughtfully chosen and picked.” A lot of these elements are objects that Sanjyt has picked up on his travels abroad — such as the metallic shoe flower vases by Maxim Velcovsky, picked up while in Prague (living room); cushions from Europe (one of the bedrooms); Clonette Dolls by Lammers en Lammers, bought in Amsterdam (dining room)… Art — both procured and customized — plays a big role in the designer’s compositional narratives. In the living room, for instance, while one wall showcases March Ahead, Sanjyt’s depiction of ‘things not being what they seem’ and yet forging ahead in the right direction; the other displays a photograph series by Lebanese Eli Rezkallah. A large anonymous painting in the corridor has been picked up from an art gallery in Bali. The gas cylinder installation called City Under Pressure from Studio Art, New Delhi, finds company in a figurine where a man is looking through binoculars, picked up from Amsterdam. 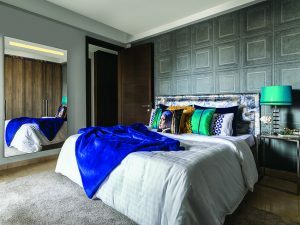 While the furniture features a mix of both store-bought and tailor-made pieces, there has been a constant attempt to create something unique in the latter case. 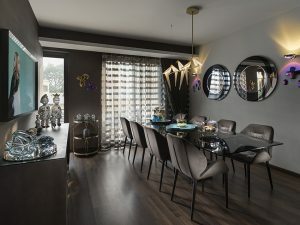 When it comes to lighting, the designer respected the apartment’s natural asset, and complemented it with a layered artificial strategy, facilitated by a high-tech automation system programmed to create different moods for different times of the day. The process of creating his home as a series of layered narratives has surpassed Sanjyt’s expectations. “If I had to describe the style, I would call it Eclectic Luxe. There’s an element of surprise mostly every line of sight,” he signs off. To create edgy interior corners with interesting pieces of furniture, art and sculptures while everything else becomes incidental. 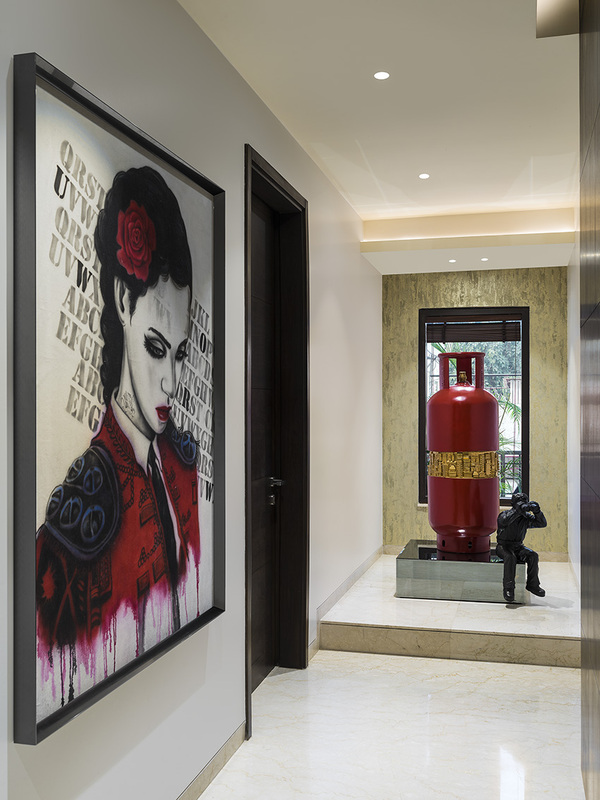 This space breaks the norms of a conventional Indian residence, and in one simple word can be described as ‘curated’. This art piece (Pigeon Post), created by the SSDS, harks back to the days when the postman used to drop handwritten letters in the letter box. The company is in the process of crafting more such unique works. The 3D sculptural vase from Simone. 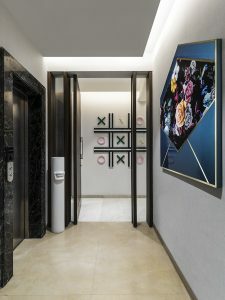 Sanjyt’s 3D art installation Infidelity in the entrance lobby talks about innocence — manifested as a childhood game of knots and crosses — lost to adultery in our society. The ants obliquely refer to the beast amongst the simplicity of Xs (pun intended) and Os. The Massimo Giacon Love Carrot sculpture from Milan is placed at the juncture of the living and dining area. The Fornasetti wall plates are from London. The opal green cabinet is one of the first furniture concepts to be developed by SSDS. 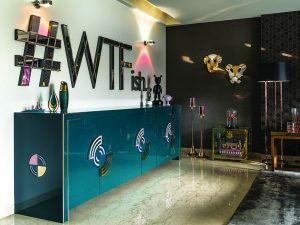 The Fishy Fish mirror artwork, again created by SSDS, talks about disappearing naivety in the young generation — which uses abbreviations such as WTF freely. Similarly, ethics and morals seem to be degrading as well. 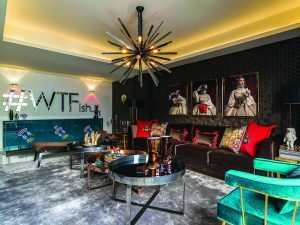 The installation is thus a merger of WTF with fishiness — hence #WTFish. This term has been expressed in two different mediums: a metal body cladded with a bevelled mirror on the face. The porcelain statues (Guest Series) on the cabinet are from Lladro. A corner of the living room: ceramic masks by Jaime Hayon from the series Bosa By Hayon grace the wall. 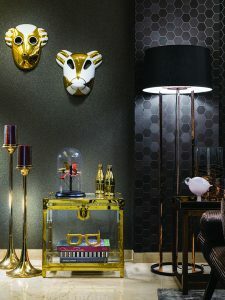 A combination of mica-textured wallpaper from Omexco and honeycomb-textured wallpaper from Carlucci di Chivasso wallpaper series by JAB Anstoetz forms a stylish backdrop. 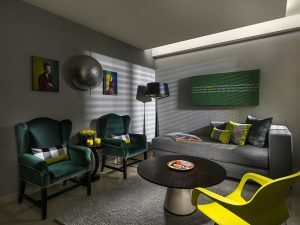 The concept of the family room started from a lone lemon and green pillow picked up from Designers Guild. 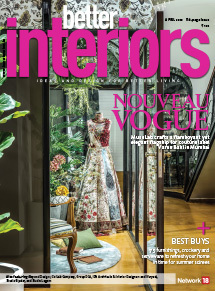 The yellow chair from Idus and the green velvet chairs — customized by SSDS — infuse vibrancy into the sombre space, along with portraits by Andrey Yokovlev and Lili Aleeva. The ambient light is from Catellani & Smith, while the floor lamp is by Stephan Lebrun. The centre table, also from Idus, can be hydraulically converted into a dining table. 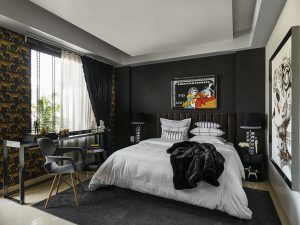 Strong masculine hues of charcoal grey and black rule this bedroom. 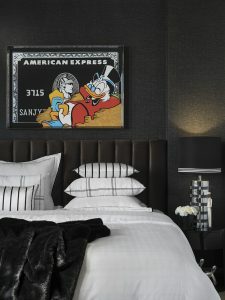 The artwork behind the bed is by Louis Nicholas Darbon. Keeping it company is a big anonymous work sourced from Bali. The wallpaper is from Cole & Sons. 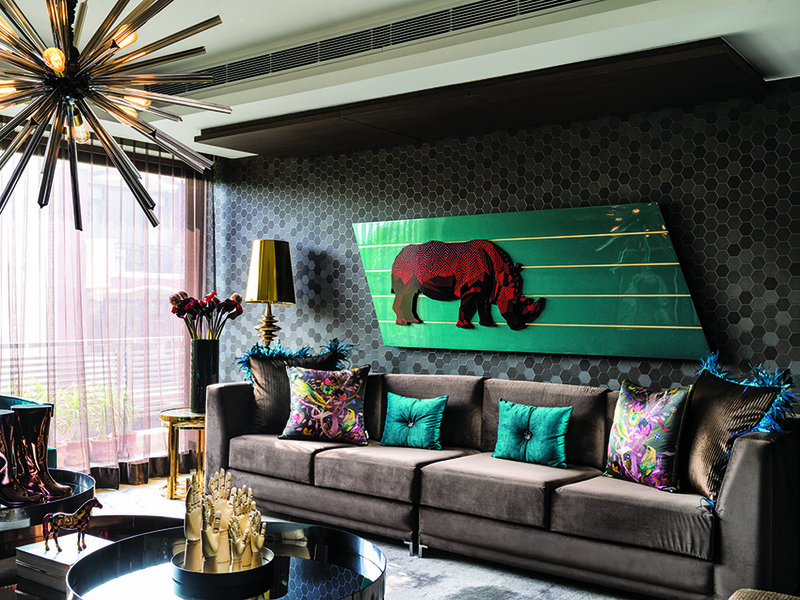 SSDS’ touches are seen in the customized lampshades and several bespoke cushions. 3D wallpaper from ARTE graces the wall behind the bed in the second bedroom. Cushions from Amsterdam and Prague accompany a fuzzy blue blankets bought in Amsterdam. The shade of the table lamp is a bespoke piece created by SSDS.